One you’ve made the decision to purchase INX tokens in the Investx ICO, it is a simple process, and below we detail how to navigate our investor portal and purchase tokens. Please see our website www.investx.io for whitepaper, currency paper and T&Cs. Visit www.investx.io and click “Login” in the top right, if you’re on mobile open the flyout menu first. You can also click “Join our presale” — it does the same. a) Create an account using your email address and a password. To do this click “Register” and you’ll be asked to input your email address, your name and a secure password of your choice. Please double-check that you have used your correct details. b) Use your Google account. 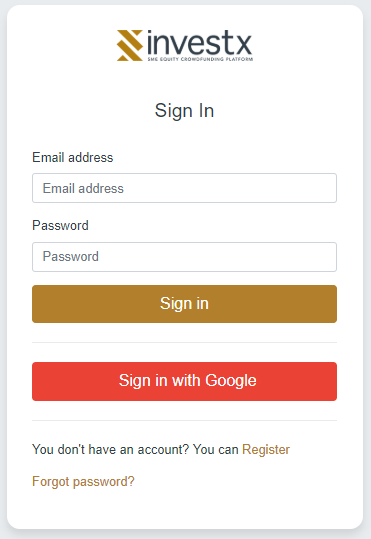 If you want to use your Google account to log in, click “Sign in with Google” and you can then choose which Google account if you have more than one. Google gives us your email address only, which is then used to assign your account. Google does not give us any passwords or other personal information. If you used Google to create an account you won’t need a separate password and you won’t need to validate you email address so you can miss out step 2 below. If you set up an account with a password, you will need to verify your email address. This show us you have access to the email account which helps us prevent spam accounts being created and also ensures your email address is correct — important because users are identified by email address. Click the link on the email and your email address is now verified. 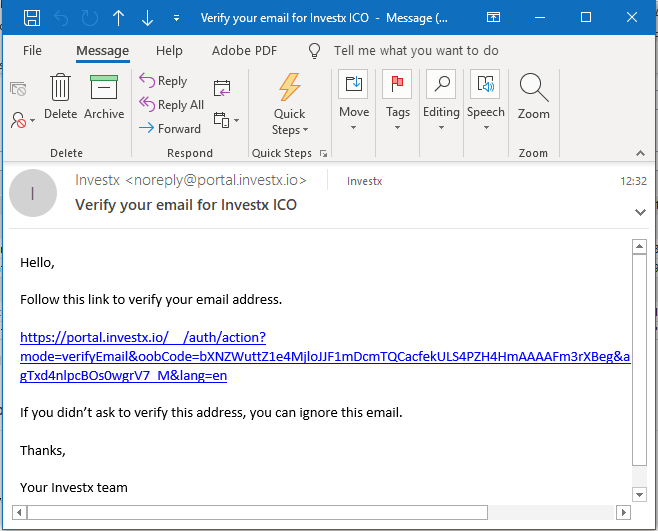 If you see a red “Email not verified” message in your Account Settings but can’t see the verification email, please check your spam/junk folders before checking with us. 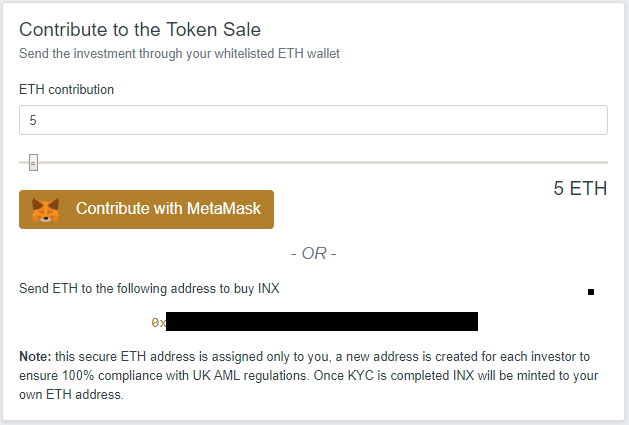 To purchase INX tokens you must first input your Ethereum wallet address, which must be the address you plan to send ETH from. INX tokens will then only be sent to this same address. You’ll find the box for this in your Account Settings page. We ask for this because Investx creates a new personalised escrow smart contract for every contributor, which ensures only funds from your Ethereum address can pay into it and sets the address to which your INX tokens will be sent. This is done to ensure that until contributors have been KYC’ed that their ETH is held separate from other contributors so that we’re in compliance with UK AML regulations. 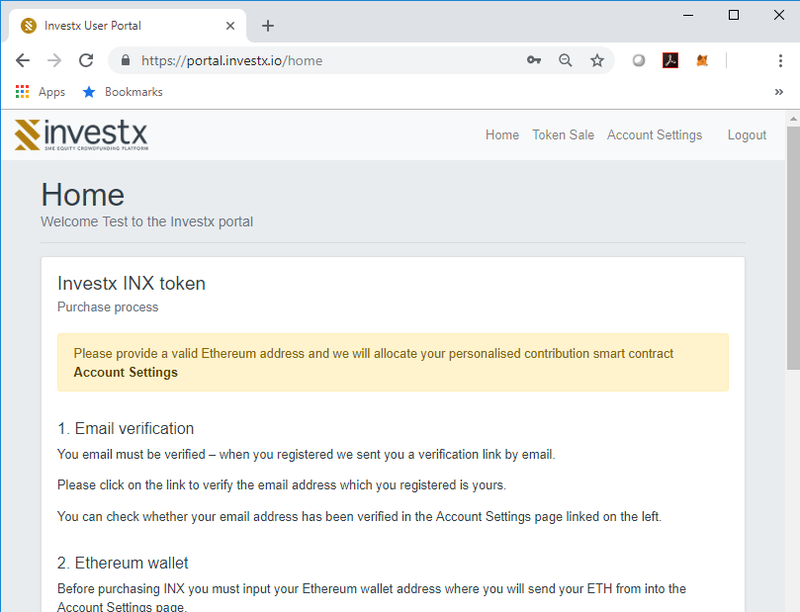 Your escrow smart contract is created by Investx after you have input your Ethereum address so you’ll need to input before you can purchase INX. Important — do NOT input your private key, we will never ask for private keys, and do not use an Ethereum address which you do not have access to or one which is third party/shared such as an exchange account. Once you have input your Ethereum address and clicked “Submit”, the box will turn green and you then won’t be able to edit it— so please double check first. 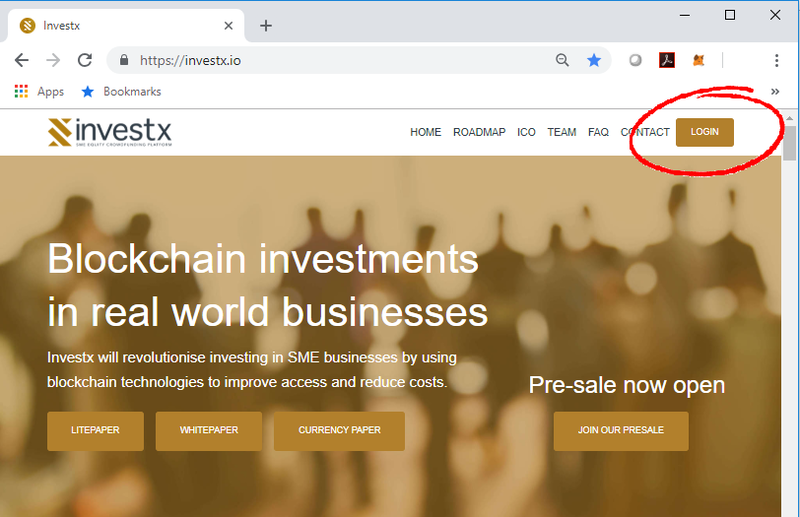 If you make a mistake at this stage email info@investx.io and we can clear the address. Step 4 — Send ETH! If you have Metamask, Metamask will pop-up asking for your approval to connect portal.investx.io to your account. Click connect to enable your personalised escrow smart contract address to be populated into Metamask. To send ETH you can then type in the amount of ETH you wish to contribute (or use the slider) and click “Contribute”. This will open Metamask and transfer the contract details, where you can then confirm the purchase using your usual secure method— done. If you don’t use Metamask then simply send the amount of ETH you wish to contribute manually to the address shown, using your preferred wallet/app. You should only send to this personalised address shown in your secure portal account. If anybody sends you an address on any social media/email this will be a scammer — Investx won’t send your contribution address out this way. You will only find the contribution address in your secure portal account. -If you attempt to send an ETH amount below the minimum purchase amount the transaction will fail. If you set up an account using your email, just click 'Forgot password' and we’ll send an email to your registered email address so you can reset it. If you registered using Google, then Google manages your password. 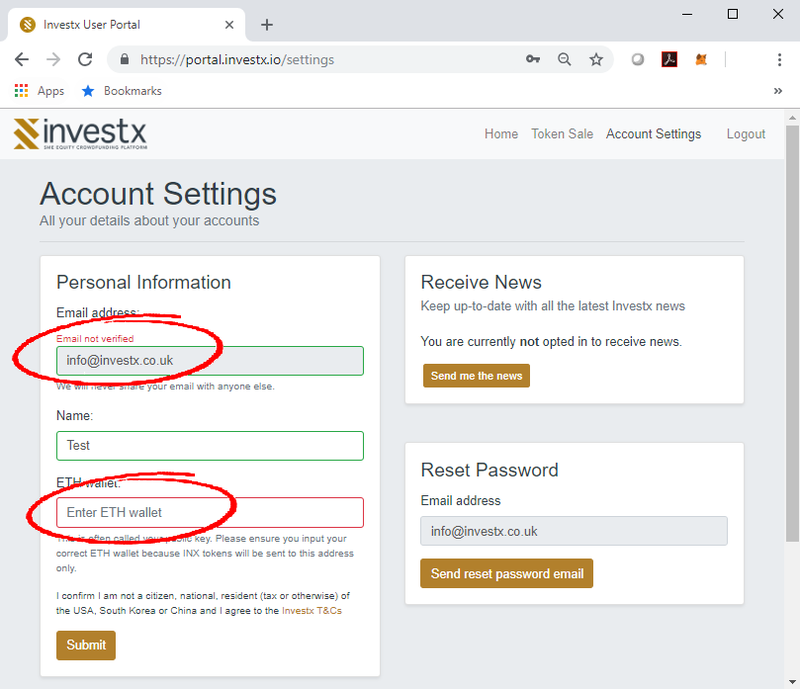 As long as you log into Google you can then log into the Investx portal.